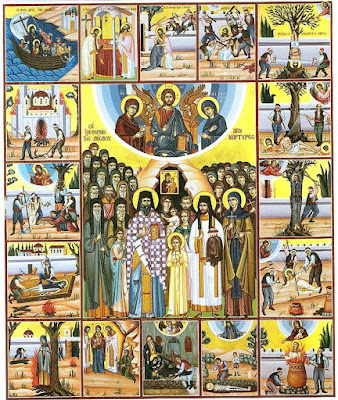 Saint Eleni is one of the Newly-Revealed Martyrs of Lesvos who are commemorated on Bright Tuesday. 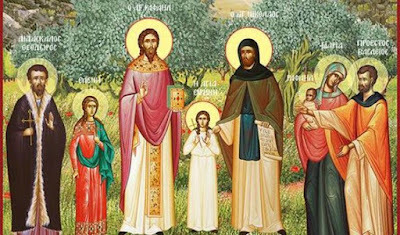 She was Saint Irene’s older cousin, who had been adopted by her uncle Basil the mayor and aunt Maria, the parents of Saint Irene, after the death of her parents. She was between fourteen and sixteen at the time of her martyrdom, and had blue eyes with blonde hair dressed in two braids (she is described as looking like a doll). When she was apprehended by the Turks, they treated her very harshly, administrating powerful blows from which she experienced great pains until she reposed. Thus she also suffered along with Saints Raphael, Nicholas, and Irene on April 9, 1463 (Bright Tuesday). "I seemed to find myself at Karyes. I entered the temporary chapel, where I beheld a girl of about fourteen or fifteen years of age. She was praying. I drew near and also began praying. The maiden then turned about and said to me, "Do you know me? A martyr, but certainly not like Renoula. But do you know what I endured? I lived with the family of the mayor. When the Turks came and tormented them, I was among them also. The Turks treated me roughly and gave me a terrifying beating, so that I died from my pains. My name is Eleni. Regarding the icon of the Panagia, the one which you all are seeking, it is inside the holy prothesis." Thus Eleni also told Mrs. Rallis about an icon of the Mother of God that she had been asking about, revealing to her the place where it would be found. The next night, Mrs. Rallis dreamed that she was in the village church. She saw three clerics coming out through the left door of the altar. She made the sign of the Cross at once, for she thought that Satan might be tempting her. Then she saw the three clerics make the sign of the Cross, too. They looked at her and smiled as they slowly proceeded to the center of the church. Then, straightway, I saw others coming forth from the door and approaching the saints. First there was a man of average height wearing civilian clothing, a long grey jacket. The unknown holy martyr said, 'The teacher Theodore.' He, in turn, was followed by a comely man. The holy maiden then uttered, 'The mayor Basil.' Then there came forth a tall and stout woman, about forty years of age, and two young girls. The latter I recognized immediately. They were Renoula and Eleni. The latter I had seen in an earlier dream the previous night. The holy martyr then said, 'The woman is the mayor's wife, Maria, and the others are Renoula and Eleni. How come the other night when you received a dream that you did not think to tell anyone? Eleni is a martyr and ought to be commemorated as such. She was not the maidservant of the mayor, but his orphaned niece who lived with them. Her full name is Eleni Susanna. The latter name is how they preferred to call her.'" Mrs. Rallis slowly approached Saint Irene. She embraced her and began to weep, saying, “O Renoula, my tortured little girl, how could these heartless evil-doers burn you?” Then Saint Irene also started to cry.